(Bloomberg) -- The rout in managed-care stocks has exceeded even the most bearish expectations as policy makers in Washington spar over proposals that threaten to disrupt their businesses. 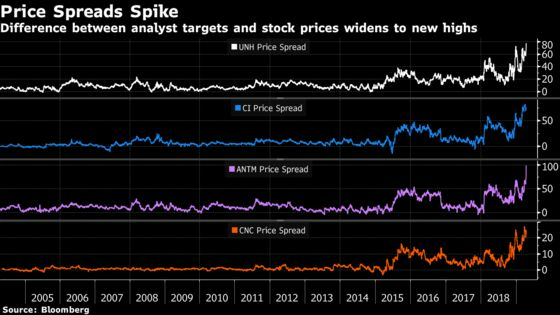 Several U.S. health insurance providers have seen the spread between their stock prices and the average analyst price target widen to the highest levels in at least 15 years over the past month, according to data compiled by Bloomberg. Shares of companies like Anthem Inc. and Humana Inc. are trading around $100 below their average analyst targets. UnitedHealth Group Inc. has fallen to its lowest in a year, while Wall Street has remained almost unanimous with buy ratings. The rift between Wall Street bulls and eroding sentiment among investors may be explained by the difficulty in predicting politics, according to JPMorgan analyst Gary Taylor, who has covered the industry for 25 years. That’s because health insurers have become more reliant on government-sponsored programs like Medicaid and Medicare. The ACA, also known as Obamacare, extended coverage to millions of Americans by expanding Medicaid and creating exchanges where people can buy health coverage. Privately run Medicare Advantage plans have seen rapid growth and become a lucrative line of business for insurers. The government picks up much of the cost for people enrolled, therefore ensuring a steady revenue stream for companies. Democrats are proposing to expand health insurance to all Americans through Medicare for All, which could replace private health insurance with a government-run plan. And while policy analysts have dubbed the idea “an impossible dream,” growing support for this and other proposals has scared investors. The S&P Supercomposite Managed Health Care Index extended losses on Friday, falling as much as 5 percent, on pace for a weekly drop of more than 9 percent. More than $40 billion of market value has been erased from some of the largest providers over the past two months.